Who has the tougher job? Different people may give different answers; but for the Department of Labor and Employment (DOLE), Manny Pacquiao and Alaxan FR, no job is too small or too easy. Because it is in how one performs the job – whether he rises above the pain and the challenge—that determines whether a job is tough or so-so. With this in mind, the DOLE and the People’s Champ together with top pain relief brand Alaxan FR launched the “Search for the Toughest Jobs in the Philippines” – a groundbreaking initiative that seeks to honor Filipino men and women who face the challenges of their day-to-day jobs with pride, resiliency and most of all toughness. “In the case of Manny Pacquiao, it’s the pain of training for a boxing title; for the promodizer, it’s the long commute to be able to give service to grocery shoppers; for the teacher, it’s the leg cramps after long hours of standing to be able to impart knowledge to students. Really, pain is a badge of honor. It’s one sign that you’ve exerted enough effort and commitment to do your job well.,” asserts Sheila Rono, Alaxan Brand Representative.. The “Search for the Toughest Jobs in the Philippines” is open to all working Filipinos and will run from May 26 to August 21, 2010. Each participant must log on to www.toughjobsphilippines.com, register and upload a picture explaining why they have the toughest jobs. The entry who gets the most number of votes online will win the competition and will bring home a trophy and a cash prize. For this effort, DOLE is also extending its full support to the project, tapping key organizations under it such as the Occupational Safety and Health Center (OSHC) and the Bureau of Working Conditions (BWC). “The labor sector requires enhanced support from the DOLE and all other sectors and it is in the spirit of partnership between the private and public sector that will create solutions and opportunities for human capability and development,” notes Undersecretary Rosalinda Baldoz, Cluster Head of Labor Relations. Through the years, Alaxan FR has been the champion of Manny Pacquiao, and even the ordinary working man when it comes to pain relief. With the help of two of the most potent and doctor recommended pain relieving ingredients in the world: ibuprofen and paracetamol, Alaxan FR answers the need to alleviate pain in pain hotspots including the lower back, neck and arm areas. 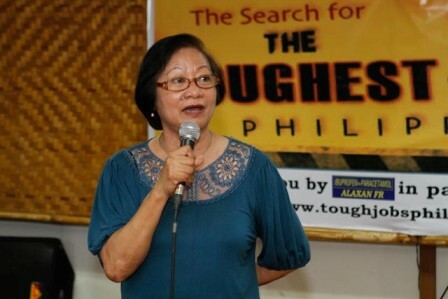 The idea of pain seen as a badge of honor is seen in the “Search for the Toughest Jobs in the Philippines.” Supported by the three champions of the Filipino workingmen - the DOLE, Manny Pacquiao and Alaxan FR — it is hoped that the contest will go a long way in celebrating the Filipinos’ resilience, strength and toughness. Alaxan FR contains Ibuprofen (200mg) and Paracetamol (325mg), two of the most widely used and trusted pain relievers by doctors worldwide. It is used for the relief of mild to moderately severe pain of musculoskeletal origin such as myalgia, arthritis, rheumatism, sprain, strain, bursitis, tendonitis, backache and stiff neck, as well as tension headache, dysmenorrhea, toothache and pain after tooth extraction and minor surgical operations and for the reduction of fever. Alaxan FR is available at leading drugstores and supermarkets.